While the world of modern finance can sometimes seem mind-bogglingly complex, the notion of divestment (as used by the BDS “movement” as their own middle name) is remarkably simple to understand. 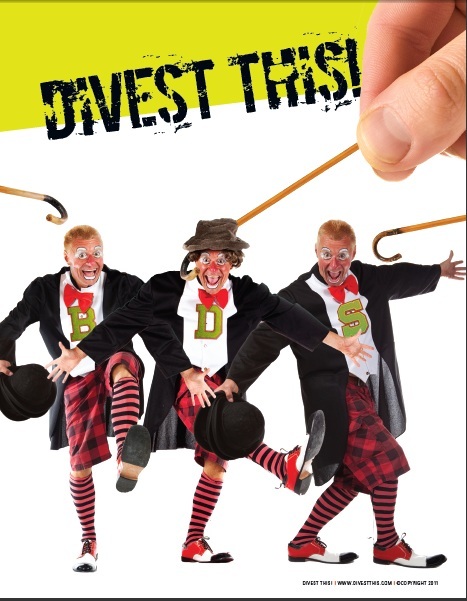 For “divestment” (as the BDSers use the term) is specifically a political act consisting of the decision by an institution (such as a school, church or financial firm) to sell off assets for the sole purpose of making a political statement (usually in protest of the company or country associated with the assets being sold). Such political divestment is not only distinct from other activities that also involve the selling of assets (such as selling stocks because you feel they will soon decrease in value), it is often in opposition to motivations behind these other sorts of selling activities (especially if political divestment involves selling assets that might otherwise benefit an institution financially in order to make a political statement). As a political decision, divestment must be a public act. For divesting secretly (i.e., not explaining to anyone WHY you are selling off specific assets) drains political divestment of all political meaning. And just as critically, the people who must ensure the world knows why they are divesting for political reason are the people who are actually doing the divesting. This seems so obvious it feels strange to have to explain it. But in nearly every case of a BDS boasted “victory,” (such as Hampshire or TIAA-CREF), you’ve got a situation where someone other than the organization allegedly doing this divesting (Students for Justice in Palestine – or SJP – in the case of Hampshire, Jewish Voice for Peace – or JVP – in the case of CREF), has claimed the right to speak in the name of and assign political motivation to a third party. To show you how such claims must be considered bogus, consider if I was to claim that TIAA-CREF continuing to hold millions of dollars in stocks from companies on various BDS blacklists as representing the retirement giant’s faith and devotion to the Zionist enterprise and contempt for the BDS “movement.” In such a situation, most BDSers would legitimately cry foul and explain that CREF has bought those assets for purely financial reasons. Yet when organizations like Hampshire or CREF sell off just a small portion of these same assets (while retaining others), in swoop these same BDSers claiming that such decisions were not only political, but were the direct result of their own BDS-related activities and campaigns. Even when the organizations allegedly doing all this divesting strenuously deny that they made any political decisions, the boycotters continue to fire off their victory press releases and create more and more convoluted explanations as to why an organization like CREF (which has made statement after statementregarding their rejection of JVP positions and requests) are actually in the BDS camp. In the past, I’ve attributed this behavior to a post hoc fallacy in which the boycotters claim (and maybe even believe) that because their own political activity preceded the decision by an institution to sell off assets on the BDS blacklist, that their campaigns caused these sell offs. While such an explanation seems ridiculously simple-minded and self-serving, it at least gives the BDSers some wiggle room to claim logical incompetence, rather than the desire to deceive, as the motivation behind their many fraudulent statements (especially in cases where the sell-off of assets represented pure business decisions or automatic decisions made by computers – as the result of indexing mechanisms, for example). But in the case of the most recent BDS hoax related to TIAA-CREF, the spearhead organization behind the CREF divestment campaign (the aforementioned Jewish Voice for Peace) is not just claiming that because CREF sold some Caterpillar shares after JVP’s divestment campaign started that CREF was thus responding to their campaign. Rather, they are assigning specific, human decision-making to the TIAA-CREF organization which they claim in their press release not only sold the shares specifically for political reasons, but did so in defiance of a named US Congressman. And while post hoc fallacy can explain an argument that because A preceded B that A caused B, assigning make-believe motivation to human decision makers who clearly did not make the decisions being described can only be seen as a deliberate act of deception. And so the claim by JVP and others that TIAA-CREF has divested from Israel is exposed as a lie for the simple reason that TIAA-CREF has NOT divested from Israel (presuming divestment means what it means when the BDSers themselves use the term). Now JVP et al can always prove me wrong by holding a press conference with the decision makers at CREF to confirm their version of the truth. But absent that, we can only conclude that the BDSers have returned to old habits of hoaxing. Lacking the ability to get TIAA-CREF itself to confirm their claims that TIAA-CREF is now in the BDS camp, the BDSers have been reduced to spinning wild tales about an organization that, as far as I know, has never come up in any BDS discussions to date: the financial indexing firm MSCI. As far as I can tell, the boycotters are trying to say that we should ignore the fact that TIAA-CREF has refused to divest and continues to deny that they have divested, and to instead assign a CREF divestment victory to them because of the decisions of this third party. And who is MSCI and what did they actually decide? More on that tomorrow. TIAA-CREF divested $72 million in Caterpillar stock from its socially responsible divestment fund because Caterpillar was removed from the MSCI Socially Responsible Investment Index. The BDS victory isn't so much TIAA-CREF's divestment (as I agree with you that it seems to have lacked much political motivation at all), but rather the removal of Caterpillar from the index. Again, the removal from the MSCI Index is hugely significant because it serves over 5000 clients worldwide. As for the motivations behind the MSCI decision, both the Mondoweiss article I posted yesterday and the Forward article someone else posted yesterday verify that Caterpillar had a below average index score before these labor issues arose. The authors of both articles also claim that they spoke with representatives at the MSCI who verified that Caterpillar's contracts with Israel played a role in Israel's already low score. Even if it were the labor issues that eventually broke the camel's back, both articles imply that those labor issues wouldn't have done so alone had it not been for Caterpillar's already low rating. Since the goal of the BDS movement is to financially constrain companies that serve to extend or prolong the occupation, how can you deny that this goal was achieved with Caterpillar? Whatever way you try to spin this monumental event, the TIAA-CREF divestment and the removal from the MSCI will be seen as a tremendous victory for BDS by both the BDS side and the pro-Israel side. Looking forward to your response. But by your own admission, there was no TIAA-CREF divestment, which makes it kind of hard to take a BDS movement seriously that is still boasting about the success of their TIAA-CREF divestment campaign while using as evidence the behavior of a completely different organization. I understand your desire to move the conversation away from the BDS “movement's” being caught lying (again) and spin towards accusations that other people are lying and spinning, but I'm afraid the truth will continue to come out unless and until the BDSers themselves can explain to us (1) why they continue to talk as thought TIAA-CREF made a decision they clearly did not make and (2) how they were privy to conversations that provided them such intimate detail (including CREF divestment in defiance of a US Congressman) based on no evidence whatsoever. I made no such admission. TIAA-CREF did indeed divest. Some of the press releases definitely could have had better explanations. But whether you are to assign the primary victory to the TIAA-CREF divestment or the MSCI de-indexing, BDS still wins – it's certainly not a hoax. 2) I'm assuming you're referring to the JVP press release. All of the Congressman's quotes were excerpted from a press release posted on the Congressman's website. I don't think JVP ever claimed to have any knowledge about the behind-the-scenes negotiations, if any, that may have transpired between the Congressman and TIAA-CREF. If, as you say, the TIAA-CREF sale of Caterpillar stock “seems to have lacked much political motivation at all” (I would have used the word “any” vs. “much,” but we’ll let that go for now), then TIAA-CREF DID NOT divest from Israel (with “divestment” defined as the BDSers do to mean the sale of assets to make a political statement). So it’s not a question of this phrase or that phrase on the BDS press releases needing tighter wording. It’s an example of BDS champions spinning the automatic sell-off of indexed assets as someone else’s politically motivated decision, in other words: a lie (something quite different than a victory, “monumental” or otherwise. Similarly, JVP did not say that a congressman condemned their TIAA CREF campaign, and that TIAA CREF ended up selling off assets on the BDS blacklist several months later. They deliberately linked the two events by claiming that the second event was done in defiance of the first. And since defiance is not something that can be assigned to the passive voice, their description of what took place can only be seen as claiming human agents within TIAA-CREF decided to divest from Caterpillar specifically for the political reasons assigned to them by JVP and that they chose to do so in defiance of a well-known Congressman. But since (again – as you admit, even if you won’t own up to the meaning of your own words) TIAA-CREF DID NOT engage in politically motivated divestment, then this whole JVP description of what took place can only be seen as a deliberate and deceitful fabrication. Believe me, I understand your dilemma. Given the long track record of BDS hoaxes (read Hampshire, Blackrock, and even TIAA-CREF two years ago), the idea of getting your hand caught in the cookie jar so soon before the BDSers plan to show up at the Presbyterians General Assembly screaming “trust us” has got to sting. But your effort to spin this as a MSCI-specific victory (“don’t pay any attention to that man behind the curtain talking about TIAA-CREF”) would sound a little less hollow had you not just discovered this “monumental” MSCI “win” a day after getting caught lying about CREF (again). I love this response. It's pretty obvious that you privately acknowledge that Caterpillar was downgraded by MSCI in whole or in part because of its contracts with the Israeli government. Even if TIAA-CREF's divestment wasn't motivated by the political and humanitarian situation in Israel at all, MSCI's most certainly was. But, instead of making that concession, you're trying to frame the entire event as a BDS failure because you disagree with how it was advertised. But you know what? I'm OK with that. You continue to deny that BDS won, and I'll continue to celebrate the fact that the Caterpillar divestitures are beginning to role on in. Arguments would certainly be easier if you got to choose the positions for both sides. But, unlike BDS press releases, here in reality you don’t get to decide what every party to the debate really believes. The fact remains that BDSers were caught red handed over the last several years trying to pass off general business decisions as politically motivated and assigned themselves the right to choose the motivation for those allegedly divesting from Israel. It happened with Hampshire, it happened with Harvard, it even happened with TIAA-CREF over an entirely different fraudulent divestment story that we were all supposed to accept as truth simply because the BDSers refuse to admit they were lying. So if we’re skeptical about this story, whether you continue to frame it as the increasingly indefensible “TIAA-CREF did what we told them to” lie, or reframed around a slightly more ambiguous story regarding MSCI, the reason no one is taking your claims at face value is that BDSers have a long track record of not telling the truth, never admitting error and replying to challenges with increasing levels of bombast about their ever expanding list of triumphs (all during a decade when both the Israeli economy and Caterpillar stock have been in a race to see who can double in value faster). Absent a statement of any kind from either TIAA or MSCI that they took this action, in whole or in part, as a divestment from Israel, then it simply can't be considered such. I would actually like them to clarify the matter, and look forward to a statement one way or the other. If, as I suspect, this sale of shares was not undertaken in support of any divestment regime, then we can put the matter to bed as yet another BDS hoax, in the long line of hoaxes (e.g. Hampshire, Khazars, Palywood) perpetrated by the anti-Israel community. If, on the other hand, this was a divestment action, then I will be divesting myself of any holdings related to TIAA or MSCI. In either case, a statement is in order. Maybe you should call MSCI yourself? I laughed when I read the BDS “Victory” press releases coming out Friday – it was such a clear fraud. Does anyone still take these charlatans seriously? I just read that letter from NYU faculty that supposedly instigated this whole mess and the reaction from Congressman Ackerman. Having attended undergrad at NYU, I was curious who signed the letter. Of course there is the expected huge underrepresentation of people in the 'serious' disciplines such as the STEM fields. They managed to net 1, 1, 0, 2, and 1 professors or staff from physics, chemistry, biology, neuroscience, and economics respectively, out of probably around 30 in each of these departments. But even in the entire Tisch school of the Arts they got only 7 out of probably 100. But beyond that I recognize some specific names. In the course of my history minor I had a course in modern China taught by Rebecca Karl, apparent signatory. Among other take-aways from that disaster, she was adamant that aspects of quantum physics – which she absolutely did not understand – justified a deconstructionist view of the world and of science in general. It was pure nonsense of the kind satirized in the Sokal hoax. It is therefore quite ironic to see that Sokal himself signed the letter. But what really jumps out is the absence, except for Sokal, of the more prominent NYU professors. Where is Gurland? Hogg? Magnussen? Apparently they stayed the hell away from this letter. Years ago, when the BDS'ers thought consumer boycotts were the way to go (before they realized how quickly we'd respond with a “Buycott”)- Trader Joes was the object du rage, for daring to sell frozen Israeli garlic cubes. One of the BDS “talikng points” was that consumers should only buy local and suatainable agricultual products (though strangely enough they weren't targetting tomatoes from Canada or squash from Mexico- just Israeli garlic) It was clear then, as now, that they'll manipulate truth to achieve victory. To the rational people of the world, this seems like a hollow victory- but in the absence of any concrete or real victories, they'll take what they can get. Incidentally, they are using the same tactic as they try to get municipalities to avoid Veolia – rather than talking about israel- they are bringing up environmental issues, and employee relations issues. So it appears that Caterpillar's association with Israel was one of several sub-dominant factors. So not really a dramatic victory there, BDSers. In any case, it may be time for a buycott of Caterpillar stock. With the Quakers divesting from close to a million dollars in Caterpillar shares last month and now these recent MSCI and TIAA-CREF victories coming to the fore, I think that a new precedent is being set. 🙂 Couldn't come at a better time. What are the Quakers doing with $900,000? And during this very same decade, the value of both the Israeli economy and Caterpillar stock has soared to unprecidented levels. So forgive me if the non-divestment by TIAA-CREF and the ambiguous decision-making by MSCI has as much impact on world history as your last “monumental” victory: the decision by Meg Ryan to cancel her vacation to the Jewish state. As a veteran socially responsible investor, I am well educated as to the process of social screening. Some funds have an absolute screen against companies that make products used by militaries (not taking it to the illogical extreme of food provisions, but talking about equipment used for military purposes). I'm not aware as to whether MSCI-ESG has such a screen. If they do, then it is actually entirely logical that they eliminate Caterpillar on that basis– which is not a statement about the conduct of either Caterpillar as a corporation or Israel as a country. It's just a criterion just like tobacco or gambling– they don't want to invest in that sector at all. Some may use a relative weighting. More information will be forthcoming as investors like me (who are invested in TIAA-CREF's Socially Responsible fund as well as Morgan Stanley funds) get more information from our investment advisors. I strongly suspect that we will receive definitive statements from MSCI that their investment decision does not indicate any political position on Israel's policies vis-a-vis the Palestinians. Not that this will faze the BDS propaganda machine–it's pretty much impervious to facts. Just curious- Is there anyone on the JVP email list that actually supports JVP? More like JVP is in party mode. If JVP's original stated goal was Tiaa Cref's divestment from 6 companies, and they didn't achieve that, or anything remotely similar, why would they “party”? Maybe, because in their reality challenged world, even a fake victory is better than 11 years of loses?